Back on February 22, Facebook announced that a newly discovered bug had caused them to under report Reach for several months. 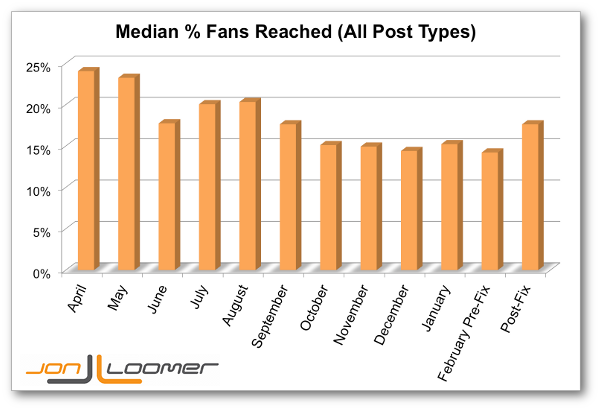 One month later, what does the median percentage of Fans reached looked like on my Facebook Page? This doesn’t look particularly drastic at first glance, partly because Reach was so healthy for me through August. Even after fixing the bug, the median percentage of my Fans reached with a post isn’t close to what it was in April, May, July and August (when it was at least 20% each month). The rate of Fans reached since the fix is the highest I’ve seen since September. 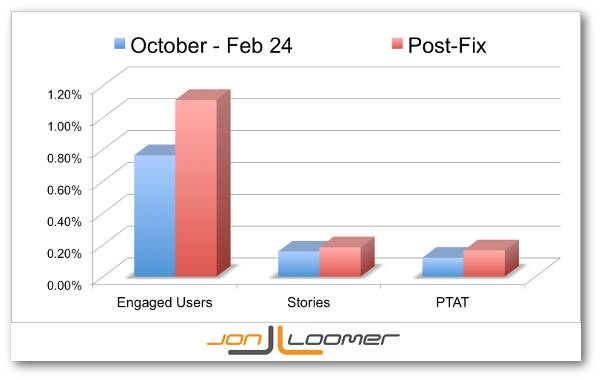 In other words, my data supports that Facebook did in fact adjust reporting of Reach beginning on February 25. Of course, Reach really doesn’t matter. Only Engagement matters. The strange thing? Even though there was no connection between Engagement and the drop in Reach during the bug-filled months (Engagement remained steady), Engagement has also increased for me since February 25. Median percentage of Engaged Fans, Stories Per Fan and Fans Talking About This are all up since the bug fix. Percentage of Engaged Fans is currently at its highest level ever for me. I’m not going to say this is a trend yet. It shouldn’t be a trend, based on what Facebook told us. They said we’d only see a change in Reach because of an error in reporting. If that is the case, a higher reported Reach should not impact Engagement. It’s a small sample size for now. Any number of things can explain a rise in Engagement for my Page, and it’s very likely that this isn’t a universal adjustment. But I’ll be watching it closely. If others are also seeing this, we have to begin to wonder if Facebook’s “fix” was more than simply reporting. Are your Fan Engagement numbers up, too?